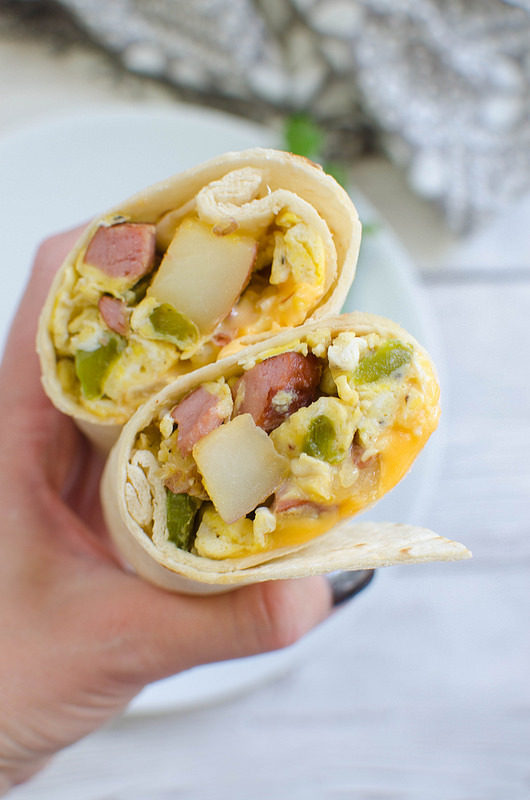 Kielbasa and Potato Breakfast Burritos – easy make ahead breakfast or dinner idea! Kielbasa, potatoes, and peppers rolled into tortillas with cheese and eggs. Heat 1 teaspoon olive oil in a large skillet over medium high heat. Add potatoes and cook until browned, 6 or 7 minutes. Flip and continue cooking until until tender, another 5 minutes or so. Push the potatoes to one side and add remaining teaspoon of olive oil. Add kielbasa, onion, and green pepper and cook, stirring frequently, until kielbasa is browned and veggies have softened. Lower the heat to medium. In a bowl, whisk together eggs and salt and pepper. Add the eggs to the skillet and cook, stirring frequently, until desired doneness. Set aside. Warm tortillas one by one in a clean skillet. Once warm, place a slice of cheese on one side of each tortilla. Fill with about 1/2 cup of the kielbasa mixture. Roll up burrito style. Continue until all ingredients are gone.